John Duncan was undeniably the foremost painter of Celtic Symbolist art and he created a world of beauty and romance inhabited by pale princesses, tragic heroes and fantastical beasts based upon the rich narratives of Scottish mythology. His imagery was based upon the fragile maidens of the Pre-Raphaelite Burne-Jones and Celtic folk-lore, but laced with the exoticism of European Symbolism and the works of Gustave Moreau and Puvis de Chavannes. In 1907 Duncan had visited London and had been enchanted by the works of Botticelli, Mantegna and Crivelli at the National Gallery and returned to Scotland determined to try to capture the same bejewelled beauty in his own work. 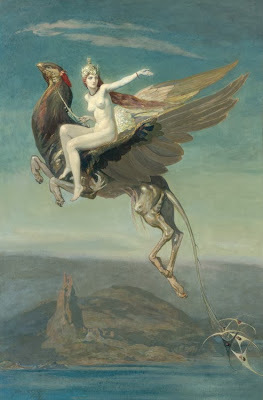 He embarked upon his most significant large oils, including Angus Obb of 1908 (National Gallery of Scotland), Heptu Bidding Farewell to the City of Obb of 1909, The Riders of the Sidhe of 1910 (Dundee Art Gallery), St Bride of 1913 (National Gallery of Scotland) and The Children of Lir of 1914 (City of Edinburgh Museums and Art Galleries). 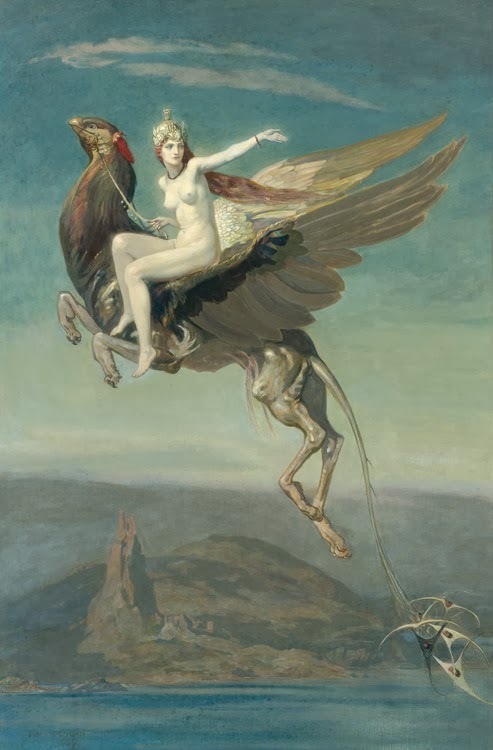 Heptu Bidding Farewell to the City of Obb is the most important painting by Duncan to remain in private ownership. It was bought from Duncan by André Raffalovich and hung in the dining room of his home on Whitehouse Terrace in Edinburgh. Raffalovich was a playwrite and Symbolist poet of considerable talent but is perhaps best-known as the wealthy companion of the poet John Gray. The jealousy that Oscar Wilde felt for Raffalovich and Gray's friendship is much documented; Wilde considered Gray to be his protegé, perhaps even the inspiration for The Picture of Dorian Gray. Raffalovich had lived in Paris in the early 1880s and was therefore educated in French Symbolist art and literature; he was a great friend of Mallarmé and several other leading Symbolist poets. Duncan met Raffalovich in 1907 when he executed a series of paintings of the Stations of the Cross for the parish church of St. Peters in Edinburgh which Raffalovich had funded. Duncan was greatly impressed by Raffalovich's knowledge of Symbolist art and writing and it is likely that Heptu Bidding Farewell to the City of Obb was the result of a direct commision. The subject of the present painting appears to have been the invention of the artist. It depicts a naked girl with alabaster white skin and flame red hair billowing in the breeze, riding high above the sea on the back of a majestic and fantastic beast. She wears a crown of gold and her neck and wrists are decorated with strings of garnets or rubies. Her jewels and crown suggest that she is a Princess of the island of Obb that she is now fleeing. Her palace stands high on a rocky dias, an imposing fortress beside the sea, and the land is cast in shadow, perhaps suggesting that she is forsaking her homeland because it is no longer safe to remain. The painting poses more questions than it answers and this is the beauty of Duncan's work which creates its own mystery and mythology. In 1934 Duncan painted a similar beast, a sphinx in The Challenge in which Oedipus approaches the riddler of Thebes in a wilderness of barren rocks and serpents. Like the princess in Heptu Bidding Farewell to the City of Obb, Oedipus is naked, perhaps to make the contrast between primal bestial power and human frailty. With Heptu Bidding Farewell to the City of Obb Duncan created an image which showed that the influence of French art upon Scottish artists was not limited to the influence of Manet and Mattisse upon Fergusson and Peploe, but had a slightly earlier influence upon an artist whose artistic aims were very different, to create a dream-like world of legend.